Mediterranean ferries: interest in LNG. File image/Pixabay. Ferry operator Caronte & Tourist's gas-powered ferry Elio may be joined by others as demand for the alternative bunker fuel in the Mediterranean region begins to grow. Baleraria's Hypatia de Alejandria, another ferry powered by liquified natural gas (LNG), is also operating thereby highlighting the need for an infrastructure able to supply LNG bunker fuel to gas-powered ships, according to maritime news provider passengership. LNG is available at five ports in the Mediterranean with plans for 10 more from mid-2019 including the French port of Marseilles. 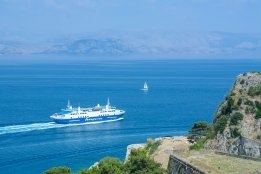 Ferry company Attica Group is working on a dual-fuel ferry project and the project involves a Greek LNG distributor, the report said. Factors driving interest in LNG as marine fuel in the Mediterranean are operator worries over the cost of low sulfur fuel oil once the 0.5% sulfur cap is in place and the prospect of a further tightening of emissions regulations if the Mediterranean becomes an emissions control area.